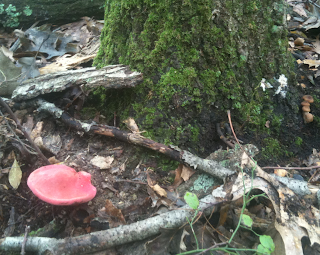 Edibility: Tasty. 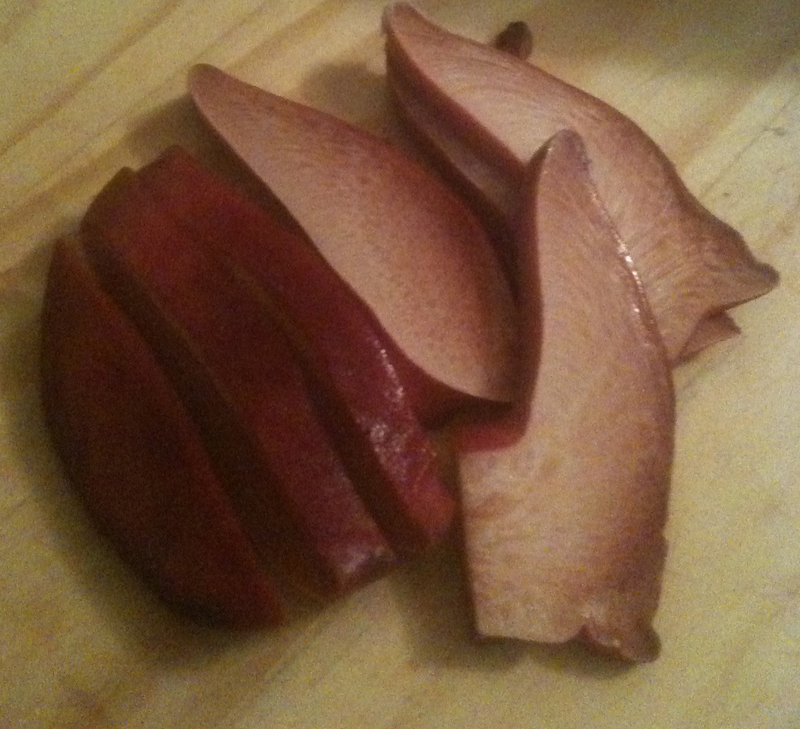 Remarkably like beef, with a noticeable tart character. Defining characteristics: Looks like a slab of raw beef growing at the base of a dead or dying tree. Not much you can confuse this one with! 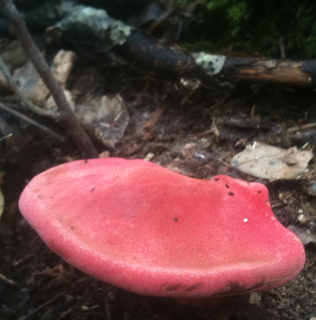 It has a bright red color, is a polypore (i.e. it has pores not gills on its underside), and exudes a reddish juice when cut. Sometimes confused with: Hunks of raw meat hanging out in the woods. Not much else. Recommend cooking method: Sautéed in a little butter with a dash of salt. Just like a high quality steak. The beefsteak polypore is a pretty unique mushroom. I was rather grossed out by it the first time I ran across it in the woods (seeing as it looks and feels rather like a bloody steak), but now that I have enjoyed it's culinary qualities it is much more attractive. 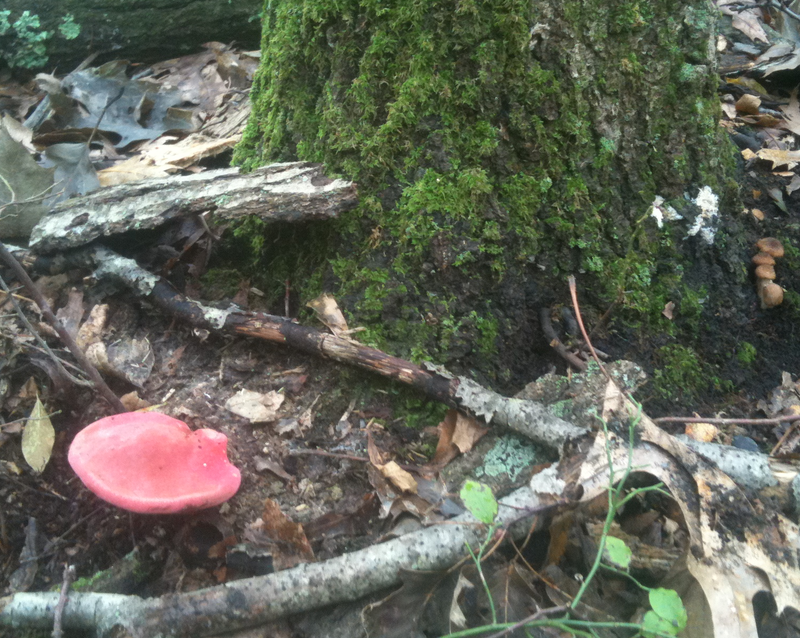 This year (2011) is the first season I have seen this mushroom in Rhode Island, and sources suggest that is a fairly uncommon mushroom in the Northeast. Time will tell, but I certainly would be happy to see it around more. All the specimens I have seen have been at the base of dying oak trees growing solitarily or in a very small clump. You probably are never going to find enough of these to reliably make a meal, but I would certainly recommend trying them out if you get the chance. They are the third of the edible polypores that we find here in Rhode Island (and New England in general), along with the Chicken of the Woods, and Hen of the Woods. Definitely the least common of the three, but they make up a great family of mushrooms that are all quite safe to eat and easy to identify. Flavor wise, it is pretty remarkably like beef. There is a definite sour/tart note to it (just imagine a steak with a lemon marinade), but it is a pretty awesome meat substitute. If you find any, please post a comment as to what are you live in, when you found them, and what you thought of them- I am interested to see how often people encounter these curiosities! To read more from qualified sources check out: Wildman or Wikipedia. I found 3 this week around Asheville North Carolina. 2 on dead oak stumps and one on a heavily coppiced chinese chestnut in my yard. I've tried some raw, and they are an interesting flavor, but i think they're very tasty cooked. I found 6 on a dead tree last year, end of Aug,beginning of Sep. My kids and I actually loved these mushrooms, and I would put them in my top 5 list. I went to back to that tree e few days ago hopeing to find more, now the tree fell over and no mushrooms yet, I sure hope they will grow a few more years. I have been picking wild mushrooms for over 30 years and would have to say that I never found these until last year. I pick in Indiana county,Pa. I found 2 in their prime on a stump in Roger Williams Park last October, found an old one on a living oak on the East Side of Providence 2 weeks ago.